​How Much is a CBT Test? One of the most common questions we hear is - how much is a CBT test? The price of a CBT test is dependant on when and where you are looking to complete the training. Worth noting the CBT test is actually training and not a test at all. There is usually a price difference between completing your CBT test on a weekend or a weekday as well as a variety of prices between our locations for CBT Training in London. What does the price of the CBT test include? The price of a CBT test includes the instruction and training from an accredited instructor. Included in the price is also a bike that you will use on the day of training ( you can choose either and automatic scooter or manual motorcycle) as well as other motorcycle gear including a helmet, jacket and gloves. 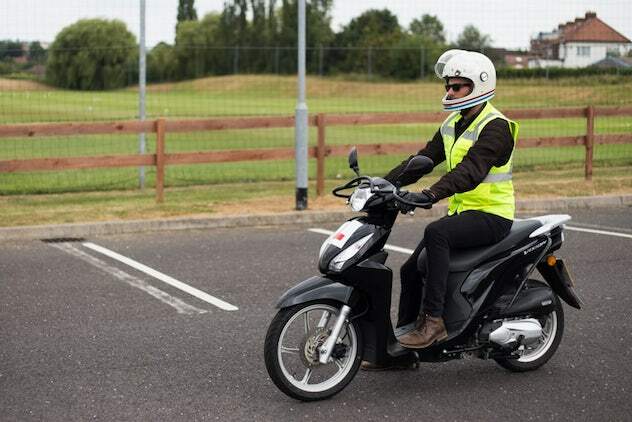 All you need to bring to your CBT test training is a valid licence card, wear a pair of sturdy trousers such as jeans and boots, which provide ankle protection. Can I pay for my CBT test on the day? You must make your booking at least one day before you are due to train. This is done so your space is be reserved at the training session. As such you would need to pay ahead to make the booking.At RideTo, you can easily book your CBT test training online or over the phone with a credit or debit card. Can I pay for my CBT test in cash? We do our best to accommodate a diverse range of payment facilities. At the moment we take card payments through our online and phone booking systems. If you’d like to pay in cash, you can do so at our main office in Brixton, London. Please give us a call for more information on making cash payments for your CBT test on 02036039652. Can I receive a refund for my CBT test? Yes. To issue any claims of refunds or to change your CBT test details, you must do so within 3 working days before you are due to start a CBT test. We unfortunately will not be able to issue a refund or change your training details after this point. Refunds are also not issued in the event you do not pass your CBT test or if you require further training. As you can imagine, the instructor still needs to be paid for a days work! Is there a returning rate if I have not completed my CBT test in 1 day? Yes, there is a returning rate if you booked a CBT test course with RideTo.com. The rates are subject to change according to the date, time and location you repeat a CBT test with. Best is to give us a call or email so the team can best advise. Can I buy a CBT test certificate? As a reputable booking platform for CBT test courses, RideTo does not condone purchasing a CBT test certificate without first completing the full CBT training. Not only will be putting yourself in danger without the necessary training required, you are also in jeopardy of breaking the law.